Pompoms, Stars, Stellars and Collerettes... During Neill's recent sourcing visit to Holland, he discovers a new world of divine Dahlia varieties, not usually available as cut flowers, to bring back to his Belgravia boutique and concession at Harrods. In this blog post he shares the story behind these delightful flowers. One of the great privileges I have obtained thanks to working closely with our growers in Holland over the past 10 years is access to flowers that are not usually available to florists. Their trust and confidence allows us many exclusivities and novelties such as test trials of new varieties from the breeders, the entire production of rare flowers and recently "borrowing" plants from a grower, so that we could pick the flowers fresh for clients at our Harrods concessions, before returning them to the glasshouse in Holland once all the blooms had been picked. Another privilege during this month, during the season, is that I am able to offer some of the most divine blooms of Dahlias direct from the showgarden of Holland's most reputed Dahlia plant and tuber producer. These flowers are not grown for cutting but their beauty is so extraordinary that I really want to share them with my clients and the grower has agreed! There are 5,000 different varieties of Dahlias today, classified into 15 different flower types, only 4 of which are available as cut flowers for florists. At the Belgravia boutique and our concession at Harrods, thanks to Geerlings nursery, we will now be able to enjoy some extraordinary beauties that are rarely seen outside the garden. Waterlilly, Ball, Pompom and Decorative are the classified types of Dahlias that are commonly found as cut flowers for florists as well as a select few of the Cactus type recently introduced by specialised growers. Waterlilies are saucer shaped, quite flat at the back; Ball Dahlias have fully double blooms and are round like a ball varying from 5 to 10 cms wide; Pompoms are miniature Balls; Decoratives include Giant Decoratives over 25 cms wide, Medium Decoratives are 15 to 25 cms and Small Decoratives which are similar to the Waterlilies in size, 10 to 15 cms. Cactus Dahlias with their spiky-shaped petals also vary from Large up to 25 cms, to Small at 10 cms. Waterlilly Dahlias are the only type of Dahlia that continue to grow and open in the vase. This gives them a long vase life and makes them strong as a cut flower. The Ball and Pompom Dahlias are also strong because they are picked once their round shape is fully developed, hence they do not require a lot of energy in the vase to open as do the other Dahlias. Decorative, Cactus and all the other Dahlia types cannot continue to live once picked, hence their vase life is limited to approximately 5 days. Since we receive our flowers direct from the growers within 24 hours of picking, we are able to enjoy the magnificence of these flowers for several days before they die. 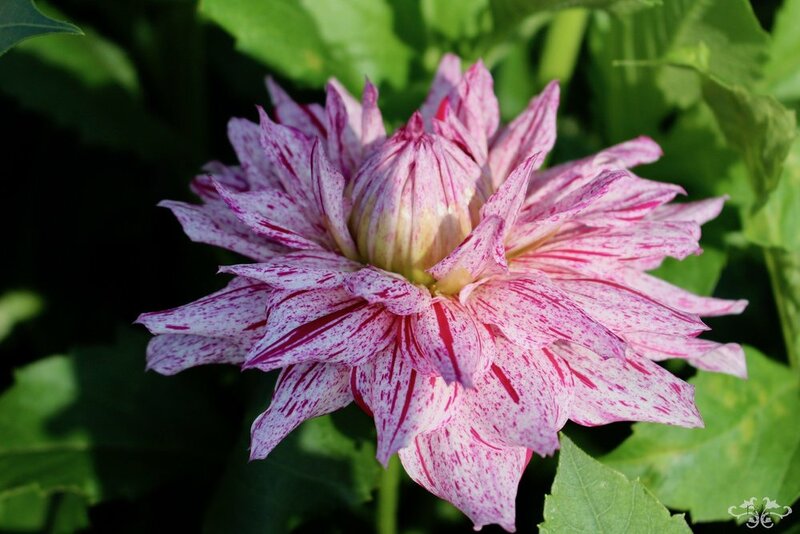 The other Dahlia types which are reserved for the garden are: Single-Flowered, Anemone, Collerette, Fimbriated, Star, Double Orchid, Peony and Stellar. All these images depict Dahlias currently growing in the Geerlings show garden. This nursery was created by 18-year-old Cor Geerlings in 1945 with funds that were allocated by the U.S. military to aid Dutch people to overcome the destruction of the war. Located 20 km west of Amsterdam in Heemstede, this is the best area for growing Dahlias due to the sandy soils. Cor's work as a breeder is historical, in particular for his species "Glory of Heemstede" in 1947 which has been widely used by other breeders all over the world as a prototype for creating new Waterlily varieties. 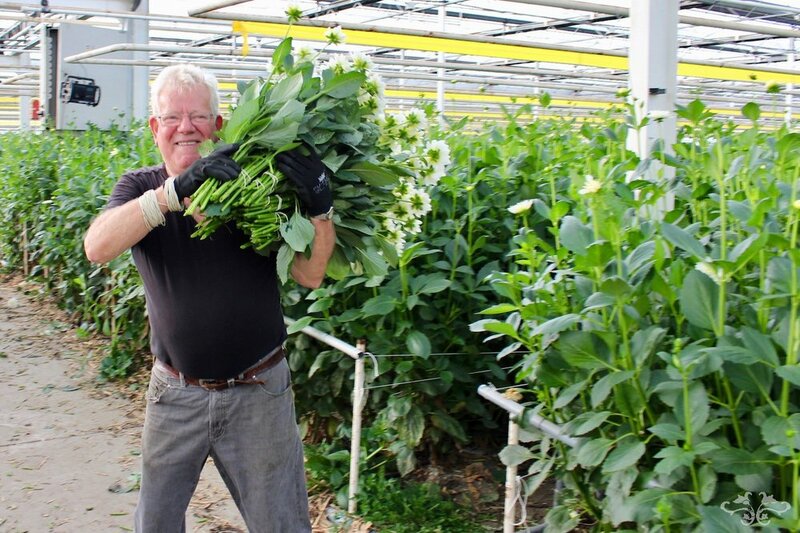 Cor continued to work in the nursery, even in a wheelchair during his later years, until his death in 2012 and today his son, Jan, continues to run this family business with his wife Elly who has also bred some new varieties such as "Elly's Pride." Varieties created by Cor were usually named after members of the Geerlings family or his students - mostly female! Originating from Mexico, Dahlias were brought to Europe only 300 years ago. With their hollow stems, they bloom in the autumn with head sizes ranging from minute to gigantic. In Holland, many of the famous tulip bulb fields are planted with Dahlia tubers after the tulip bulbs have been removed. This is because Dahlias are one of the few bulb flowers that can be planted in late spring or early summer to bloom in late August and September. Like the tulips, these Dahlias have their flowers cut off as the energy is being preserved to strengthen the tubers which are then sold at nurseries around the world. Dahlias were popular after World War II, lost favour in the 70s and had a come back about 10 years ago. They are popular with the breeders as they are easily and rapidly cultivated. Whereas a tulip bulb can only produce one additional bulb per year, a Dahlia tuber produces 10-12 new growths for cuttings which result in 10-12 new plants, plus an additional tuber. The short vase life of the cut flowers is being improved every year as the breeders pursue stronger varieties while the season is also being extended to start in the early summer months. Here are some new breeds still in the experimental stage, unnamed, at the Geerlings Garden Showroom. 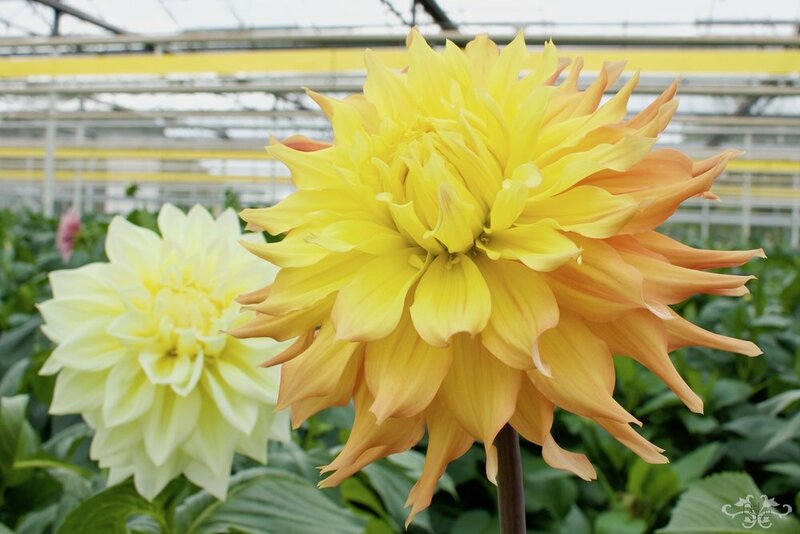 So we can offer these spectacular flowers to our clients as many months as possible during the year, I source them from March until November cultivated in the glasshouse by Holland's finest Dahlia grower who has perfected the art of growing these blooms indoors. Without a doubt, Dahlias are one of my favourite flowers and I hope after seeing this blog post they will be yours too! Their variety of colours, shapes and forms is remarkable and I am very grateful to be able to display these exceptional blooms at our boutique and at Harrods. So do come visit us and see for yourself.